How to Play 1-4-5 Bass Guitar Progressions. In terms of fundamental chord or melody structures, the 1-4-5 progression is a common and familiar part of guitar and bass guitar music. It forms the basis of traditional blues and rock patterns. Playing the 1-4-5 is as easy as identifying the chords/notes of the scale on your fretboard. Get good at marking off rhythmic "bars." 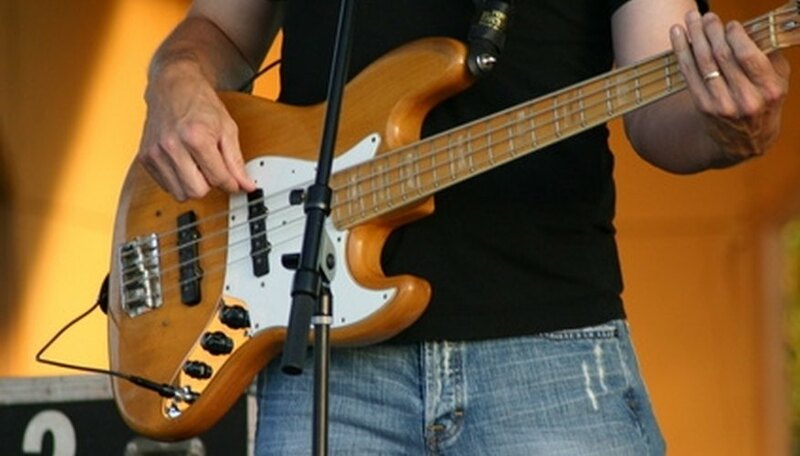 In a 1-4-5 pattern on the bass guitar, you're going to rely on rhythm to make your progression recognizable and catchy. Practice the four-beat bar as a measure of your playing. Begin at the beginning. There are many variations on the 1-4-5, but the most basic and recognizable one is based on a series of bars, and it starts on 1, which is any note depending on what key you're in. The lowest and "open" key is E, since your bass guitar's lowest string is tuned to E. So for a playable example, let E be 1. Play two bars of the E note. Go up to your 4, in this case, the A note, for one bar. Move back down to your 1, in this case E, for one more bar. Play one bar in your 5, which is B. Practice playing this progression until you recognize it from any rhythmic blues music you may have heard before. Add "extra" notes like the G on your low string within the bars, always resolving to your E, A, or B at the end of a bar. Over time, your 1-4-5 progression will get clearer, sturdier and more elaborate. Stay simple in the beginning. You may want to treat each of these "bars" as 4 notes. For example, playing: E, E, E, E, A, A, A, A, etc. and then getting more complex as you go along.